Galatopita, (pr. Gha-lah-TOH-pee-tah), which means milk pie, is a very simple, rustic, Arcadian, traditional pudding cake which dates back to antiquity. It is made with simple ingredients such as goat or ewes’ milk, eggs, flour, honey and cinnamon. Since ancient times, trade has had an important role in human life. During their travels abroad, the ancient Greeks brought back various spices with them. The addition of vanilla to this dessert is more contemporary. My husband, who comes from Isioma, Karyon, Megalopolis, in Arcadia (Peloponnese) left his village when he was ten years old. His father went to Athens for a job when he was very young. Two of his four sisters went to Athens as well, one to work and the other to attend high school. Eventually the remaining family went to Athens when my husband was ten years old. However, he has many memories from his childhood and he tells me that this was the traditional dessert his mother would usually make on Easter day. During the fasting period of Lent there was abundance of ewes’ milk and eggs, so apart from making cheese, trahanas or hilopites, they still had a lot to make desserts. All the houses back then, had a wood fired oven in their yard. My mother-in-law used to make bread once a week, so when she baked bread and the oven was warm, she would also plan a meal or a dessert that needed baking. One of the desserts she used to make was “galatopita”. Yesterday it was our Wedding Anniversary (28 years!!!) and we had a little family celebration, so I prepared this for dessert for my husband. Its simplicity is what makes it so good. 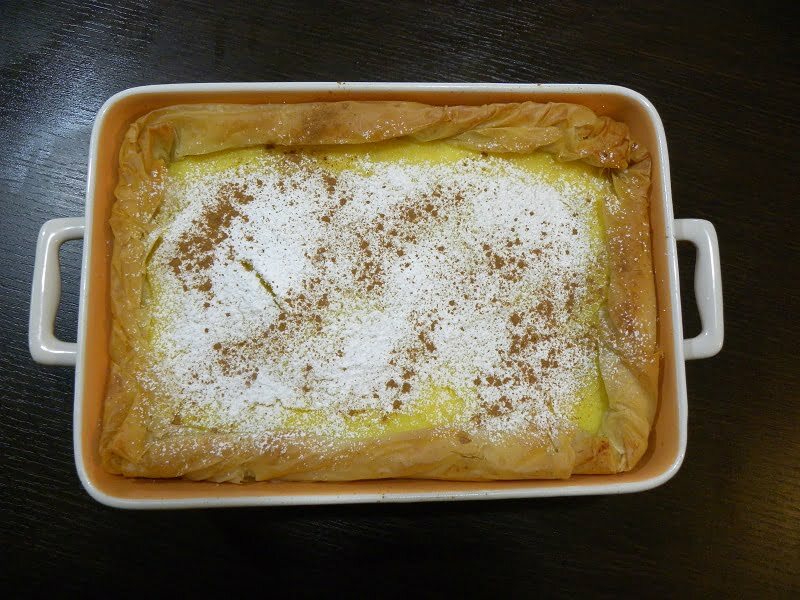 The first time I made Galatopita, I had some leftover phyllos, which I used as the base of this dessert. The original recipe was given to me by one of my sisters-in-law and is without phyllo. The recipe is measured with glasses*, as was the old traditional way. You can use a normal glass you drink water in and use the same glass to measure all the other ingredients. A cup of sugar for example is 225 grams. As you will see below, a glass of sugar, not filled to the rim, is almost the same weight. However, if you substitute the measurement with cups it will still work because the capacity of a normal water drinking glass is almost the same with a cup. When I made her recipe the first time, I just folded the overhanging phyllos on top of the pudding and the centre was “naked”. When I made Galatopita again, I used phyllos again but simplified the procedure. The pudding I made is similar to the one I use to make Galaktoboureko but without a top layer and syrup. I used three sheets of phyllo which I wet with clarified butter. Since we now live alone in Assini, just the two of us, I adjusted the recipe to make it in a small Pyrex. I brushed each phyllo with the melted butter and layered them on the baking dish, each time changing direction, so that all sides of the baking tin were covered. After adding the pudding, I folded the phyllos, which were hanging outside of the baking dish by forming them into a roll, around the rim of the baking tin. As they dry easily, they must be brushed with butter to keept them soft. Butter a 25 X 30 cm baking pan. Heat the milk with half of the sugar. Whisk the eggs with the remaing sugar until white and frothy. In a large pot, add the semolina and the lemon zest and whisk to combine. Add the hot milk whilst whisking. Put it on the heat and keep whisking, until the cream thickens. Add the whisked eggs mixing continuously, until incorporated. Pour the pudding into the prepared pan. Whisk the egg with sugar and water and spread over the surface of the pudding. Bake for approximately 40-45 minutes, or until the top becomes golden-brown. Serve warm or at room temperature, with some honey or icing sugar and cinnamon sprinkled on top. I am submitting this recipe to the Sweet Pies Event I am hosting but as I also love baking, I am submitting this to my friend Ben, of What’s Cooking, for his event I love Baking. The traditional Greek baklavas, is made with many layers of thin sheets of "phyllo kroustas", which are brushed with butter, with various kinds of nuts and spices added between the layers and sweetened with honey syrup. Galaktoboureko in kantaifi nests is a twist of two classic Greek recipes: Galaktoboureko, which is a pastry with semolina pudding and Kantaifi, which is a pastry filled with nuts. Galatopita, which means milk pie, is a traditional sweet pie from Arcadia, Peloponnese. The original recipe was made during Easter. Grease a 17 x 25 cm Pyrex with butter. In a larger pot, put the eggs, remaining sugar, semolina and salt and mix to combine, using a balloon whisk. Add the hot milk, mixing quickly with the balloon whisk and then put the pot on the heat. Stir continuously until the pudding comes to boiling point and sets. Cover with cling film and set aside to cool. Brush a baking tin or Pyrex with butter. Layer the phyllo sheets, alternating from horizontally to vertically, so as to cover the sides of the baking dish. Press the phyllo sheets with the brush, to make room for the pudding. Empty the pudding and spread out evenly. Fold the phyllos, which are outside of the dish, forming them into a roll. Brush them with some butter. Empty the pudding in the Pyrex and put it on the centre rack of the oven. Bake for approximately 35 – 40 minutes, until it becomes golden on top. Remove on a rack until it is lukewarm and sprinkle with some icing sugar and ground cinnamon on top. Sounds just divine..And happy wedding Anniversary Ivy!! Thank you Divya for your wishes. Happy Anniversary and many more of years of happy marriage. I have been comming across lot of new recipes after comming to your blog. Thank you very much Happy Cook. I hope you like the new recipes you see. Happy anniversary to you and yours, dear Ivy. May you have many, many more. 28 years! Wow Ivy… Congratulations! Wish you both many more happy years ahead. Thank you very much Sunita, I remember yours’ was a few days ago as well. I wish you the same as well. Anudivya, thanks very much. The years pass so quickly, I can’t believe that 28 years have passed. I think it is only yesterday that we got married but my son will be 26 next month, so I can’t hide it. Thanks sis for your wishes. Time does fly quickly, doesn’t it? Congratulations on your 28 year anniversary Ivy. Galatopita is so delicious and I agree with you that its “plainess” is wat makes it unique. Thank you Peter for your wishes and like most Greek dishes this is also a very simple recipe. Happy Anniversary Ivy! I hope you had a wonderful day yesterday. Your galatopita looks delicious–I’ve never made galatopita but I think I will try very soon. Thanks Maria. Had a lovely time with the family during lunch but I was also working in the afternoon till late in the evening but that was my fault as I had arranged this a very long time ago and did not remember that it was our anniversary. Ivy, “na zhsetai”, “hgeia” and Happy Anniversary. The galotopita looks fabulous…best one I’ve seen yet! Congrats on your anniversary! This dessert looks so tasty. Oh, yummy! That Galatopita looks really good! I really have to make this pie soon as I’ve been meaning to test that recipe since long..
28 years! I couldn’t be happier for you both! I hope you day was beautiful. Happy anniversary, wishing both of you happiness and many many years to come. This dessert seems delicious. Happy Anniversary! We just celebrated 7 years in June so you are our “senpai” (Japanese for someone higher up the ladder than you). That recipe is making me SO hungry! Happy anniversary Ivy. Wow. 28 years! Congratulations. Hi Ivy, happy anniversary. I wish you many more happy and prosperous years. Yum Ivy! It looks like a huge custard slice to me – and I love those. Mmm, I’m quite fond of desserts. CONGRATS! 28 years is impressive. Your husband should be grateful to have such a nice wife that cooks him lots of yummy food. Wow! 28 years! Hearty Congratulations! And my Best Wishes! I’m falling more and more in love with the food of your region. Yummy! BTW, I’ll be sening you the details for the reipe I ‘m submitting for World Food Day soon. Thank you! Thank you all for your lovely wishes. Congratulations on your wedding anniversary!! I hope you had a wonderful day filled with lots of love and happiness. This milk pie looks so yummy!!! Hey guys, thanks a lot for your wishes. Happy Anniversary Ivy! What a delightful pie to serve to celebrate. Ivy, what an incredibly delicious pie. I love this. Congratulations on your anniversary. My hubby and I are celebrating our 20th year together this month as well. Thank you for stopping by my site. I always love hearing from you. May you have many more years of love, health and happiness. I love custardy pies so this is right up my alley. Thank you so much for the recipe. I want to participate but suddenly my pineapple pie seems like the poor cousin. Sigh. Let me see what else I can come up with instead. Happy belated Anniversary my friend. I will enter my sweet apple pie this weekend after my contest. As you can see I am very late here,Ivy but please accept my hearfelt wishes to you both on your anniversary. And your pie looks nlike the perfect dessert to end the day. Thank you everybody for your wishes and thank you Aparna as well. It’s not easy to follow up all these blogs and posts. Sometimes I miss a lot of posts as well due to lack of time, so I think we all understand. A different version of Galatopita from my own, but I am sure it was tasty! Looks great. Woops! I forgot to wish you a (belated) Happy Anniversary!!! Hello! Thank you for sharing this recipe. My grandmother used to make this and she died without leaving any of her recipes. I made it and it tasted exactly how she used to make it. It evoked so many beautiful memories and I am very grateful to have found your blog.